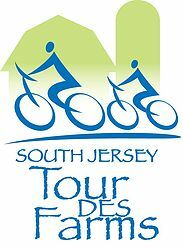 Pedal through some of New Jersey's most beautiful farmland. Get to know the diversity of Jersey's agricultural product.ion and shop for local produce as you ride. (We will gladly pick up your purchases and deliver them back to the starting point for you.) View some of the many farms preserved forever through the Burlington County Farmland Preservation Program. Ride options include a 15 mile route; a 29 mile route; and a 50 mile route. Stops along the way include a cranberry farm, vegetable farms, pick it yourself orchards, nurseries, an organic farm, an alpaca farm, and a community supported agriculture farm.The South Jersey Resource Conservation and Development Council (SJRCD), is a nonprofit organization dedicated to protecting and improving the natural resources of South Jersey. A portion of the proceeds of the event will benefit New Jersey Farmers Against Hunger!